Instant messaging (IM) service WeChat was developed by Tencent and released in 2011. The Chinese developed app, whose localized name translates to "micro message," is the most popular IM app in the world. WeChat serves over 850 million active users, the majority of whom are within China. Within WeChat, you can communicate in many ways with friends and other WeChat users. The most common use of WeChat is some form of instant messaging. Whether it's text message, voice message, or stickers, you can keep in touch in these ways, and more. WeChat also includes a walkie talkie mode, which can add an extra element of fun with friends. WeChat Pay is another big feature within the app, allowing you to pay for items from vendors using your digital wallet. Your WeChat Pay account can be topped up by accepting charges to your added debit card, or by receiving money from other WeChat Pay users. Linked credit cards can only pay to vendors, and do not allow you to top up your balance. Services vary between countries and cities on WeChat. Some options include ordering food, hailing a taxi, or paying utilities. These options require the vendors to develop a 'mini-app' for the app, which adds this feature for WeChat users to enjoy. WeChat is completely free to use, with no subscription fees. You can chat, call, send stickers, and pay for services in one convenient app. You can also play competitive games with your friends in-between times. WeChat also has a desktop app available for Windows and Mac. Wish is the number one mobile shopping app of choice used by over 300 million users worldwide. The app connects you to thousands of shops and merchants offering a wide array of products including consumer electronics, clothing and fashion, home and kitchen appliance, and many more. The app also features shops for big brands called Wish Outlets where you can get branded items with up to 50-80% discount compared to mall prices. Download Wish today and enjoy the luxury of premium shopping at your fingertips. What can you do with the Wish App? Browse products by category, shops, catalogs, or keywords More refined search with various product options like color, size, and rating Deal Dash - enjoy exclusive daily deals which let your purchase super discounted items Shop branded products without worrying for authenticity through official Wish Outlets. Big Big Savings! Get the best value for your money with Hourly Deals, Seasonal Promotions, and more. Read honest and real product reviews from Wish users. Earn a reputation from the Wish Community by providing honest reviews of product purchases. Create Wish Lists which you can share with your family or review anytime you want. Use the easy “slide-to-pay” checkout option to instant purchases. The Wish shopping platform ships worldwide and includes an extensive list of trusted merchants from all corners of the world. The app also provides customer support in more than 20 languages. What are you waiting for? Get the Wish app today and shop on the best mobile mall in the planet. Google Chrome is a free web browser developed by Google. It was released in 2008 and quickly became a popular choice. Based on figures from StatCounter, as of February 2017 it is estimated that Chrome has a 62% worldwide usage share. It is praised for its speed and simple interface design. Chrome was built on WebKit, a browser technology that is primarily developed by Apple for its flagship browser, Safari. It is developed as an open source product, making it free for others to use and modify. It wasn't until several years later that Google opted to fork a version of WebKit - making another copy of the technology. They then modified the renderer component from WebKit, which they refer to as Blink. Since Chrome version 28, Blink has replaced WebCore from WebKit as the browser's renderer. The renderer is what determines how a web page looks, which can have minor differences between browser vendors. The Opera browser has also come on board with Blink, using it as the browser's renderer since version 15. In prior versions, Opera used a proprietary renderer. Like other browsers, Chrome allows you to view web pages from your mobile device with ease. Like its desktop counterpart, the mobile version has support for tabbed windows. Many of the benefits are also universal, such as the speed and rich feature support. Google Chrome is a free browser for mobile devices and tablets. It receives regular updates from Google to keep your browsing experience safe and enjoyable. The most intense and most thrilling battle royale game is finally here to invade our mobile devices! PlayerUnknown’s Battleground takes you to an action packed adventure where you have to fight for your own survival and be the last man standing! The game will treat you with visually striking graphics and highly realistic combat that guarantees you with a remarkable gaming experience. Embark yourself in an epic battle for survival as you fight against many other online players and engage in a strategic combat to win. If you think you are skillful enough to win, feel free to explore PlayerUnknown’s BattleGround and see how far you can go. 100 real-time online players will be deployed on a remote island with one goal, to fight against each other until only one survives. The challenge, however, is the fact that you’ll start the game with no weapon at all. Players must hunt or scavenge weapons that are randomly scattered on various locations. To top it all, the battle zone dramatically shrinks from time to time and players must keep themselves within the safe area to survive. As the battle zone shrinks, the battle intensifies. You must come up with the most effective strategy to maximize your chances of survival. Do you think you have what it takes? For full gaming experience, PUBG takes you to a visually stunning graphics. Thanks to the powerful Unreal Engine 4, the game gives you a remarkable visual experience with intricate details and highly realistic gameplay effects. This is also complemented with high quality audio and immersive 3D Sound effects for satisfying gaming experience. The game is not just a visual delight as it offers you more engaging features including the ability to customize characters and other multiplayer components that allows you to team up with friends or with a squad. Definitely the best battle royale game today! LINE is a mobile communication app that connects millions of users around the world. The app offers various ways of conversing with other users through chat, voice, and video calls, as well as having group conferences. LINE was first released in Japan and then subsequently made available to the entire world. It is currently ranked as one of the top ten apps in 52 countries. Some of the exciting features of the app are: Group video call capability with up to 200 people. Create polls to get opinions from friends. Free text messaging, video conferencing, voice and video calls. Huge collection of stickers and emojis Autosnycing, backup and storage capabilities. NHN JAPAN created the LINE messaging app for internal communication of employees after the March 2011 Tōhoku earthquake which significantly damaged transmission lines throughout Japan. It was later released to the public in June of the same year and became an instant hit in the entire country. The LINE brand is currently under the auspices of the LINE Corporation, a spin off company created due to the apps immense success. From being launched in 2011, LINE has managed to acquire 100 million users just after a year and a half. By 2013, the app has become the largest social network in Japan. Today, LINE has more than 700 million users worldwide and has extended as a brand with the development of LINE Camera, LINE Play, LINE Antivirus, and many other mobile applications using the brand’s popular name. Facebook Messenger (or sometimes referred to as Messenger) is a free instant messaging service. It relies on a Facebook account to use, and allows free text and calls to other Facebook Messenger users. Facebook Messenger can be used both on the Facebook website and through the app. Facebook Messenger launched in August 2011 as a means to have some services separate from Facebook's primary app. It also sparked a greater use of the app as a large group of Facebook users were simply messaging friends and family. The Facebook Messenger app helps provide that feature in a streamlined manner. Over time, Facebook added more features to the Messenger service. 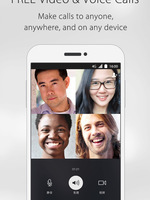 Users are now able to make video calls, share funny GIFs and even play games. Some features currently being tested in the US include peer-to-peer payments, and business integrations. One such business integration is with ecommerce sites. Shopify has partnered with Facebook Messenger to browse and even buy direct through the app. This is handled through chat bots, automated systems that can understand a user request and reply accordingly. Other chat bots are being rolled out. CNN offer personalized news articles based on interest. Poncho offers weather forecasts in your local area. Spring offers a personal shopping assistant. And more are being added to Messenger on a regular basis. Facebook Messenger does not provide an option to log out of the app. Instead, it allows you to appear as inactive, switch Messenger accounts or turn off push notifications. Prepare yourself for an epic battle! Clash of Clans will take you to a one of a kind journey that will surely put your strategic skills and knowledge on a test! Protect your kingdom, build a stronghold, create an army and conquer other territories and be part of world’s leading mobile strategy game today! Clash of Clans perfectly combines elements from a Tower Defense game, casual empire building and tactical strategy. If you think you have what it takes to win this epic battle, feel free to play Clash of Clans and see how far you can go! The mechanics are very simple. You start the game by building your kingdom. Construct buildings to gather necessary resources that you can use to strengthen your defenses. Gather gold coins from Mines and collect Elixr to upgrade your buildings and to train your troops to make you more team efficient in the battle. Upgrade the barracks in order to recruit more troops! You can unlock some of the well-loved iconic CoC characters like Giants, Archers, Balloon, Witches, Hog Riders and many more! Train them all into their full potential to maximize your chances in winning. Above all, the most important highlight of this game is your chance to join a clan or better yet create your own! You can be part of an online community and engage yourself in an epic Clan Wars! As a Clan Member, you have the ability to help your other members by sending reinforcements or by sharing some of your resources. You should also pay attention to your defenses and make sure you build enough protection to prevent any players from breaking through. Simple, fun, surprisingly challenging and undeniably addictive! This is how you can perfectly describe Clash of Clans! If you are ready for an epic Clan War, feel free to download this game and let the epic clash of clan begins! Download WeChat for Android or iOS below. These links will take you to the respective app store to download the app to your device. If available, you can also choose to download the .apk file to install on your Android device. Please note that the app may request extra permissions, or contain in-app purchases.